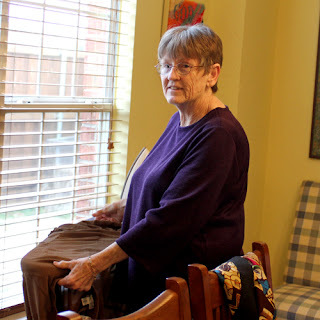 Daily Life - Bits & Pieces: Sewing! We got the machine set up, filled a bobbin, and threaded the needle. Then I practiced sewing a few scraps together. Feeling confident, I then sewed the strap back on an apron and hemmed the slip on two of my favorite skirts. I realize that it's possible I could have figured all this out on my own, but then who would have helped with the ironing? Now that I'm familiar with my machine (and have all the mending done), I'm planning to try some sewing along with my scrapbooking - watch this space for layouts with stitching, coming soon! Ah! It was you Melissa who sent me the HP trading cards. I was trying to remember to thank you on my blog. Anyway, thank you. They are one of the reasons I bought my children tickets to the studio tour ofr Christmas - because i knew I wanted to use them to scrap the photos!!! Mothers just never become redundant!!!! Yeah! Such lovely, happy photos of you and your Mum! Looking forward to seeing what you do on your pages :). That's wonderful!! I'm embarrass to say I got a sewing machine two Christmas's ago and it's still sitting in the box because I don't know how to use it. I really need to get someone over to help me. I look forward to what you make with yours. loving the new nearly bangless look on you Melissa! I bought my sewing machine several years ago just to use for my layouts. I do not sew. In fact, I know nothing about sewing---clothes, that is. Right now, I need to put more thread on the bobbin (I think that's what it's called.) Been that way for 2 months. I need to get out the book to remember how to do it! You could say, I'm sewing machine challenged!! I need to use it more! Can't wait to see what you do with yours. I'll have you making quilts before you know it my friend! 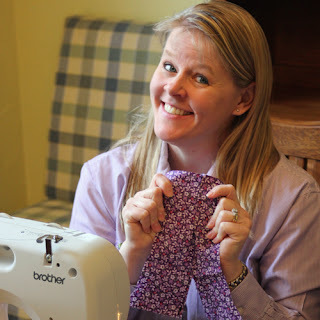 Melissa, since you are just learning how to sew all over again, if you are at all interested in quilting, this site is starting a series of tutorials for making your first quilt. lol! Good for your Mom :) Good to see you enjoying your gift so much - I love my machine, but use it almost exclusively for papercrafts...! Great to see you with your mom. 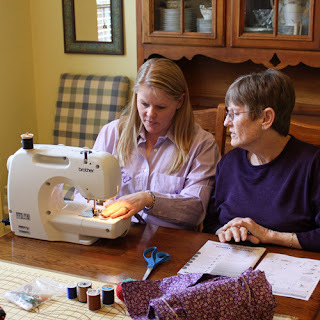 My mother taught me how to sew. 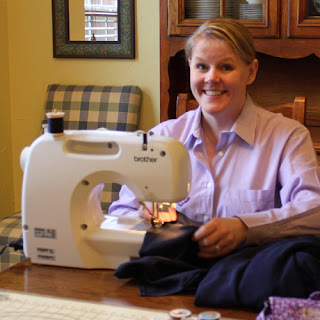 I used to make lots of my clothes, and clothes for the rest of the family as well. Now almost the only sewing that gets done is on paper! You'll enjoy it, I'm sure. Oh I love that you're sewing and love seeing the pics of you and your Mom. It's funny because I'm waiting on a class to begin real soon where we'll be making a lap quilt. I haven't sewn in years either! But I've been wanting to for awhile now and this class came about so I'm in! Can't wait to see some of your layouts you sew on. Those first couple of photos made me smile - you do look so pleased :) Congratulations on getting the mending done and how fun to get your Mum to help out too. I have yet to get mine out of the box but I definitely will by summer. Mamas are always great to spend some time with. I have a machine and I do a bit of sewing on my layouts. I'm not at all proficient with it by any means! You lucky to have someone to guide you along. Can't wait to see what you do! Good for you! I'm sewing-phobic. But the last time I sewed anything (a long, long time ago)my mother-in-law helped me. Good for you (and even more kudos to Robbie) - my machine is almost exclusively for scrap-sewing these days.